We all know that engineers are life’s real superheroes! OK, maybe I am slightly biased, but a recent trip to Wales has once again shown me just how much engineering has the ability to transform people’s lives in a way that completely transcends the physical products that are created. Welcome to the amazing world of Cerebra, an inspirational charity who support the families of children aged 0-16 with neurological conditions and are achieving amazing results thanks to a dedicated team of engineers and partners. They set up the Cerebra Innovation Centre (CIC) eleven years ago in conjunction with the University of Wales Trinity Saint David, where a dedicated team of researchers and engineers work to develop bespoke products to help the real needs of children with neurological conditions. 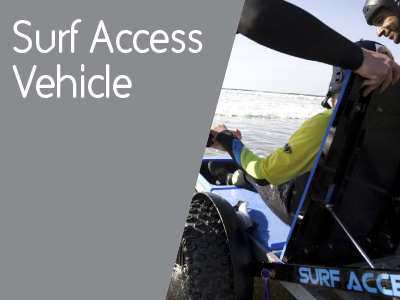 The team includes Dr Ross Head, Dan Cuthberston, Gerallt Devonald and Maria Kemeys, who create solutions in response to direct requests from parents and carers who are struggling to find the piece of equipment that would make their child’s life easier, more inclusive and more fun. These are then designed and made free of charge for the families. They make around 50 inventions per year, funded entirely by donations, and have developed everything from surfboards and rocking horses to medical stands and a system for children to independently transport their own oxygen cylinders. Many children are reliant on oxygen cylinders, ventilators or food pumps every single day, however these can often restrict their independence and create a reliance on others to be able to get on with everyday activities. This is why the team at CIC created the Oxy-Gem, an oxygen trolley which enables young children to explore freely without constant adult help whilst transporting their oxygen etc. This was achieved using free running bearings to make easy work of pulling a 4kg cylinder. A number of other great design features have been incorporated too, ensuring that the child is able to walk un-aided. For example the wheel bearings only move forwards, meaning that the wheels act as a brake if the child falls backwards. The back wheels also project further behind so that the Oxy-Gem cannot tip over and provides additional stability. Despite this achieving the main goal of the brief, the team didn’t stop there. As you will see, they always go the extra mile to ensure that the child’s wider needs are at the heart of every design. A system that started from hacking a Trunkie, has now developed to include everything from a seat for the child to take well-earned breaks, plus compartments for their most important items such as books and toys. GoTo is a postural support seat developed in a partnership between the Cerebra Innovation Centre and Firefly. It has been created to make daily tasks easier for children who cannot support themselves so that they can see the world from a new perspective and remain at the heart of the action. The seat can be used in any situation including play parks, picnics, aeroplanes, supermarket trolleys and dining chairs. This invention provides a convenient, lightweight and portable solution which is perfect for use both in and out of the home. It helps children to sit independently and has been reiterated and developed using real feedback from parents who have been using previous versions of the GoTo with their children. Features that have been added as a result include height adjustable laterals and headrests allowing the seat to grow with the child. The covers are also completely interchangeable and machine washable to ensure that the product is practical. A lifelong condition, cerebral palsy affects movement and coordination; caused by a problem with the brain that occurs before, during or soon after birth. Because of how this condition impacts the body, an event which involves 750m of swimming, 20km of cycling and 5km of running would normally be considered an impossible achievement. But that wasn’t enough to stop six-year-old Imogen Ashwell-Lewis from accomplishing her dream of competing in a triathlon alongside able-bodied participants, which was made possible by the Cerebra Innovation Centre team. Dr Ross Head explains how they managed to achieve this unbelievable feat in the below video. RS Components are proud to have customers who are achieving truly inspirational things through engineering, such as Cerebra. You can read more about Imogen's story and the charity at Cerebra - For The Inspired. If you have a challenge for the CIC team you can contact them by telephone: 01792 483688 or by email: cic@cerebra.org.uk. Good stuff! Nice to see that there are people ready to help these brave little persons who, through no fault of their own, are facing the world from a different perspective. Well done to the team at the charity for helping these young people to live full and exciting lives and not allowing them to be defined by their disabilities. I recently made my friend Matthew a suit with hidden LEDs in it. So that his partner, Hannah, wouldn’t be out-blinged, I made her a disco necklace. A look at how the real and virtual sporting worlds are becoming more and more entwined. Also an insight into how football clubs are adapting to the digital age.